This Friday, February 1, Linda DeLibero – Associate Director, Film and Media Studies, Johns Hopkins University – and I will appear on Midday with Dan Rodricks on WYPR 88.1FM, Baltimore’s NPR News Station, during the second hour, 1-2pm, to discuss the work of Steven Spielberg. * We wanted to do a show about an important director, relevant to our time, who would allow us to do a nice run-up to our planned February 22 pre-Oscar broadcast. When we chose Spielberg, the Academy of Motion Picture Arts and Sciences had yet to announce the 2013 Oscar nominations, but we guessed correctly that Spielberg would be among the nominees. And so I have spent the last month slowly prepping for this Friday’s discussion, re-watching films I had not seen for years, and reading Richard Schickel’s new book, entitled simply Steven Spielberg: A Retrospective (for the record, full of great quotes from the man, himself, but really a piece of fluff, especially in regards to Schickel’s lightweight analyses of the films). What I have discovered through all of this research is how much I am a product of Steven Spielberg’s aesthetic sensibilities, for better and/or for worse. I was born in 1969, and Jaws, Spielberg’s breakthrough film, came out in 1975, setting the stage for the blockbusters to come, both his and George Lucas’s. His box office successes ruled my childhood. Members of “Generation X” are usually defined as having been born between 1965 and 1979, so I definitely qualify as a member. But I’d like to reject that label in favor of one that more accurately defines how we all view the world: Generation Spielberg. Jaws is the first film I can ever remember being denied the right to see. We lived in Palo Alto, California, at the time, and I remember walking down the main drag (University Avenue), seeing the film on a marquee, hearing everyone talking about it, and then being furious that my older sister was going to see it later (she was 11, but the film was – inexplicably – only rated PG). I forget when I finally did see it, but I remember having the crap scared out of me, so it’s probably for the best that little old 6-year-old was denied. To this day, though I have swum in many oceans and battled my fears of unseen creatures in the waters below me, I nevertheless cannot shake the thought that I am being stalked from the deep. I am sure I am not alone in this. That said, I love Jaws, and often use it in my teaching. It is masterfully crafted, and a work of great storytelling prowess. But Jaws is an anomaly, in that most of the Spielberg influences on me have not left me scared and scarred. The first of his films that I saw in a theater was Close Encounters of the Third Kind. We had just spent a year in France, and my father, back in California a few months before the rest of us, had seen George Lucas’s Star Wars and become an instant fan, bringing me to see it with him as soon as I returned home. I think he enjoyed Spielberg’s space epic even more than Star Wars, since he seemed to identify with the protagonist – Roy Neary, played by Richard Dreyfuss – as a father, himself, prone to singular obsessions. I liked Close Encounters, but it was a little too adult and nuanced for me. The infantile simplicity of the plot of Star Wars had greater appeal. Still, the images in the film stuck with me. And now, in my 40s – older than my father was when he brought me to see the film – I find that Close Encounters remains one of my favorite Spielberg films. And then there was 1941. Released in December of 1979, it was still around by the time my 11th birthday arrived on February 11, 1980. So that’s what I and my friends went to see. I mean, we all liked John Belushi, so we’d like this film, right? I’m not even sure we knew who directed or cared if we did know. But we did care about how dumb and unfunny the movie was. If you can’t make a group of 11- and 12-year-old boys laugh with slapstick and gross-out gags, you’re doing something wrong. 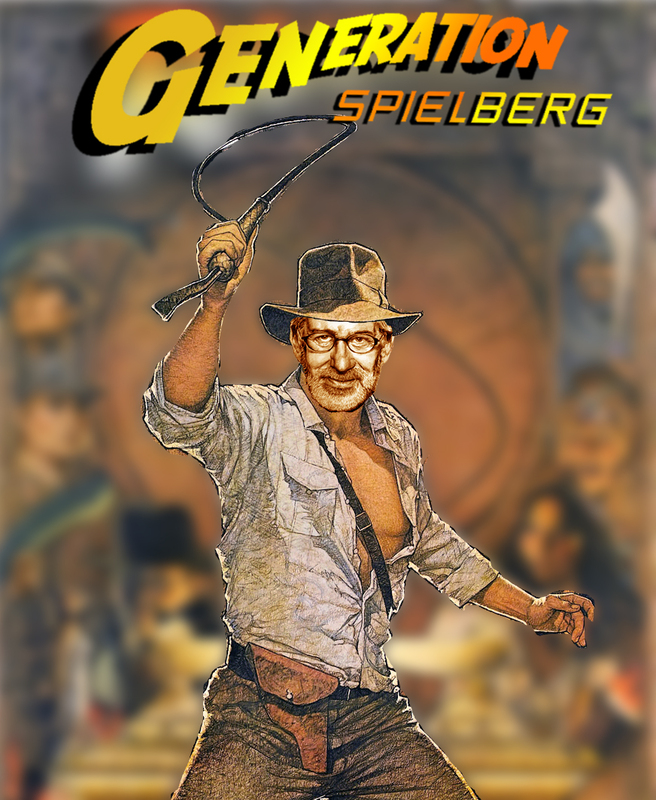 It was Spielberg’s first flop – nothing I cared about at the time – and a product of true excess in every way. As Spielberg notes in the Schickel book, he simply blew too much stuff up. It’s too busy a film to be effectively entertaining. I just re-watched the film last week, and it was just as stupid as I remembered. But there were two unexpected delights: Robert Stack as the clueless general having a blast watching Dumbo (really the funniest joke in the entire film – love it, love it, love it! ); and Nancy Allen just being incredibly over-sexed (maybe if we’d been 13 or 14, we would have liked the movie more). Spielberg’s everlasting influence on me truly began, however, in 1981, with the sublime Raiders of the Lost Ark. This film, I saw with my mother. If you were to go back in time and sit in the seat next to me at my first screening of the film (I saw it many, many times), you would have seen a look of pure rapture, and perhaps guessed that a budding cinephile was being formed. Nowadays, I can see the racism or, at the very least, Western colonialist attitudes that permeate the entire movie, and it can make me wince, but as a cinematic narrative, and as a thrilling ride, the film is beautifully constructed. I particularly like the prologue which, though not connected directly to the rest of the plot, nevertheless encapsulates everything we need to know about Indiana Jones, and lays the groundwork for the adventure to come. It is a model of economic and effective scriptwriting. I experienced an intense adrenaline rush watching the film, and have tended to respond most favorably, ever since, to films that replicate that experience for me. Fortunately, I can get that same rush from films that stimulate my mind, as well my adrenal glands, but I always look for some kind of direct involvement in the story. In a 1962 interview in Issue #138 of Les Cahiers du Cinéma, the Franco-Swiss director Jean-Luc Godard had this to say about American filmmakers: “The Americans, who are much more stupid about analysis, instinctively bring off very complex scripts. They also have a gift for the kind of simplicity that brings depth . . .” Say what you will about the “stupid” comment, I’ll take what he’s stating as a high compliment, and put Spielberg at the top of the list of directors who have mastered that kind of simplicity (in his best work). And that is what I respond to in his films: he is a master storyteller, and a master craftsman, and when equipped with a strong script, the narrative clarity he achieves allows for complexity and nuance to thrive. Even in works like E.T. the Extra-Terrestrial (not one of my favorites <gasp, I know>), the presence of a character like the government scientist, played by Peter Coyote, who seems to come over to E.T.’s side, allows for shades of grey in the story, rather than a pure black and white dichotomy. The same can be said for Raiders – who are the good guys? Sure, the Nazis are evil, but Indy is a compromised hero, and the U.S. government agents turn out to be bureaucratic fools, locking up the Ark of the Covenant in what might be a basement warehouse of the Smithsonian. And of course, the ultimate compromised hero in the Spielbergian universe is Oskar Schindler, whose motivations remain obscured. But this is a good thing, as it forces the audience to think about big issues. Narrative clarity + moral nuance = my kind of movie. Thanks for reading, and enjoy the show on Friday!